All AI Conference pass holders have access to this event. To RSVP, please contact AIBuildersSC@intel.com. H2O Driverless AI employs the techniques of expert data scientists in an easy-to-use application that helps scale your data science efforts. Eric Gudgion explores its capabilities by predicting credit card payment default using a Taiwanese bank's dataset from a Kaggle experiment. Read more. When Intel AI Builders partner Mphasis set out to build its Mphasis DeepInsights cognitive intelligence platform, the company chose Intel to help it reach its goals. Ajay Balakrishnan offers an overview of Mphasis DeepInsights, which enables enterprises to have faster and more effective access to insights from data. Read more. Yoav Einav and Vin Costello explain how to achieve faster analytical processing, leveraging in-memory performance for the cost of flash with persistent memory (~300% faster than SSD); smarter insights at optimized TCO, scaling the speed layer capacity for smarter real-time analytics with 7x lower footprint); and Agile automation of your ML and DL model CI/CD pipeline, for faster time to market. Read more. Vladimir Starostenkov and Siarhei Sukhadolski discuss two ML solutions from Altoros: one was developed to facilitate the process of assessing car damage right at the accident scene, while the second helps to automate recognition, extraction, and analysis. Join in to see how to integrate both solutions into the existing workflows of insurance, car rental, and maintenance services. Read more. Cloudera Fast Forward Labs translates machine learning breakthroughs in academia for industry applications. Shioulin Sam provides a high-level overview of this capability and discusses how it's now possible to build models and applications faster and cheaper in industries such as autonomous vehicles and healthcare. Read more. Dan Klein explores a prototype that uses AI to recognize human behavior in retail stores, using Intel Movidius to enable deep learning across video streams and connecting multiple AI functions in a single pipeline using the Intel Distribution of OpenVINO. The solution enables users to track the movement of individuals around a store with real-time recognition of gender, sentiment, and apparel. Read more. AAEON brings AI on the edge to resolve challenges developers face when they try to bring all AI tasks to the cloud, such as latency, network bandwidth, reliability, and security. Fabrizio Del Maffeo explains why UP AI Edge is the solution for cloud limitations by bringing AI performance and hardware acceleration not "at" but "on" the edge of the internet of things and the latest technology. Read more. Spark NLP provides state-of-the-art accuracy, speed, and scalability for common natural language processing tasks. David Talby shares recent achievements in accelerating Spark NLP using Intel’s optimized MKL-DNN and TensorFlow for the Xeon processor, productizing Intel NLP Architect models, and applying the library in real projects. Read more. AI-based controllers for electromechanical systems are proving to be very effective. This requires training multiple agents and solvers in parallel at scale. Sumit Sanyal offers an overview of DeepSim—a platform to design and deploy such controllers—and compares its performance against results achieved using conventional controller design techniques. Read more. Medical imaging and diagnostics involves segmentation of region of interest and classification of images for diagnostics. 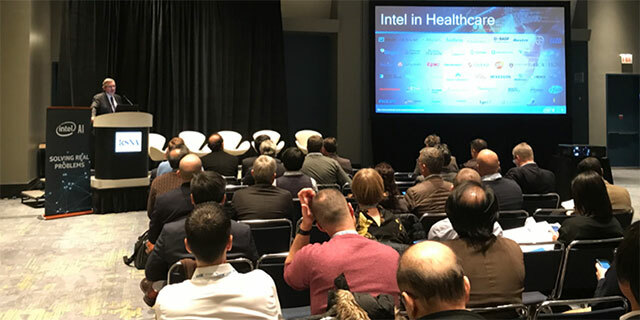 Sunil Baliga and Sundar Varadarajan share Wipro's medical image segmentation and diagnosis solution, which uses deep learning on Intel’s AI platform. Read more. Mobiliya is global software engineering services (SI) company focusing on next-gen technologies like AI and DL, the IoT, and AR/VR to accelerate digital transformation for the world’s leading companies. Rubayat Mahmud showcases Mobiliya's capabilities in AI, vision, and analytics with Intel technologies. Read more. Anaconda Enterprise combines core AI technologies, governance, and cloud-native architecture to enable organizations to automate AI at speed and scale. Rachel Jordan takes you through how to leverage Anaconda Enterprise across the deep learning lifecycle, from model building using TensorFlow to deployment on CPUs, without sacrificing speed. Read more. Nanda Vijaydev explains how to spin up instant ML/DL environments using containers—all while ensuring enterprise-grade security and performance. Find out how to provide your data science teams with on-demand access to the tools and data they need, whether on-premises or in the cloud. Read more. Tony Sandoval leads a live walkthrough of how general-purpose natural language understanding (NLU) can be customized for banking using domain-specific AI. Join in to learn how Avaamo utilizes Intel Xeon Scalable processors to execute domain-specific NLU, transfer learning, conversational intelligence, domain modeling, flow modeling, and conversation validation. Read more. Join Intel AI Builders and attendees to network and enjoy food and drinks provided by Intel AI. Read more.